Natural disasters are part of nature’s plan and are inevitable, we don’t have power to stop the natural disasters from occurring. When the natural disasters occur they bring havoc to our buildings, our properties and our life. One of the scary natural disasters are Tornado, this catastrophe has power to flatten entire houses, hurling trees, cars, animals and human beings in the air. These deadly Tornadoes come without warning and leave with heavy destruction. Human beings can never fight natural disasters, however, we have to devise measures to save ourselves from the destruction it causes. We have to be prepared for the Tornadoes like making concrete storm shelters, where we can take shelter at the time of such happening. Tornadoes can happen anywhere. yet, there are certain places where Tornadoes are known to occur commonly like Arkansas, Florida, Maryland etc. It has been estimated that almost 1000 Tornadoes occur, annually, in the U.S. and cause damage to property and life worth billions.Therefore, preparing for a Tornado is very necessary and relying on luck is a most foolish idea. Tornadoes can happen for a short duration or can remain for an hour or longer time, these unexpected natural disasters are source of great destruction. Since we can never pinpoint the exact time when a Tornado will occur, we have to be prepared in advance to tackle such emergency situations. Know the risk beforehand: It is always advisable to assess everything that is accessible to us. Tornado risks can be predicted to some extent, that will give you advance time to get ready for such situation. There are many Tornado risk assessment tools available at weather expert websites and also, you can check FEMA maps. Understanding the signs of Tornadoes like unusual clouds, dark and greenish clouds; preparing your family to deal with emergency situations, Listening to weather forecasts regularly; keeping the things available that will aid in the emergency situations is very important and can save you from devastation. Identify the things that can cause destruction at the time of a Tornado like trees, electricity poles, old buildings and remove them from your surroundings. You can also contact the Tornado experts to study your area or potential risk factors. Storm shelters should be designed according to guidelines of FEMA. 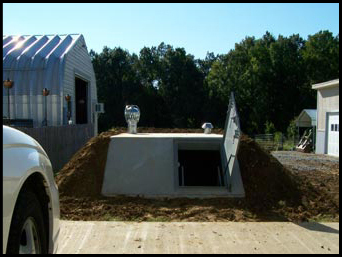 FEMA, approved storm shelters provide better protection. When a Tornado alert is given you can just have 13 minutes to find some safe shelter. Powerful Tornadoes having a speed of 250 Km per hour can uproot any well-built structure, during such time a safe place can be only a concrete room, well constructed of reinforced concrete without windows and a concrete resilient roof and floor. These shelters can withstand winds exceeding 250 mph and objects like rocks, trees at 100 mph. Therefore, these concrete storm shields are a better option to protect you and your loved ones from natural wrath. The cost of these storm shelter depends on many factors like size of the room, the location of the house where it is constructed, type of door used and the foundation on which the safe room will be based. Usually fitting a safe room in the existing house will cost heavier than incorporating it in the house at the time of construction. At the time of a Tornado listening to news updates, collecting all your emergency supplies like food and essential medicine, and clearing your home surroundings from anything that can fly at the time of a Tornado and injure someone is very important. Once a Tornado alert is announced collect everything and directly run to your safe room. Keep your family and yourself calm and don’t get panicked. Panicking can make you to lose control and do inappropriate actions, leading to injury to yourself and family. Natural disasters like Tornadoes can occur anytime, we cannot stop them from happening but we can remain better prepared.